The oh-so-sophisticated you might say “vaaaaaz”, but however you pronounce it, a vase is really just a vase. 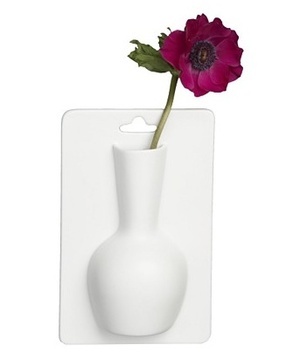 The creation of U.K. designer James Burgess, the ada hanging vase is made of porcelain in a bright white that would look perfectly poised hung on any colored wall. Sweeten it up with a solitary flower. I’d buy six and hang them all in a row – a perfect piece of “art” for the kitchen or breakfast nook. And very inexpensive, too. Measuring 5″ W x 8″ H and 2″ D, find it at cb2 for $6.95.